Ice dam removal is a popular service throughout the winter months in Michigan and the midwest. Roof de-icing services to remove these ice dams requires the right equipment and technique to safely remove these harmful ice formations. Cold weather and snow can cause major problems during the months of a Michigan winter. Our winter services include roof shoveling and roof de-icing. Heavy accumulations of snow on your roof can cause the build up of ice over your gutters and soffits. The warm air from your home causes the roof snow to melt, when that water collects over your soffits, it freezes and starts forming ice dams. The ice dams can cause damage to your home just by the weight of them, additionally keeping water from exiting your roof, where it can eventually work its way into your home. The experts at The Stain Shop can safely remove the ice dams from your home or business. 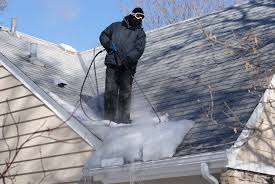 Our trained technicians use hot water to cut through the ice and remove it from the roof line and gutters. This eliminates the current ice formation and any leaking that may be resulting from the buildup. We recommend homeowners make sure they have proper insulation and air flow through their attics to minimize ice formations in the future. Click here for more info on preventing ice dams.